LOS GATOS, Calif.--(BUSINESS WIRE)--Jan. 28, 2019-- Roku, Inc. (NASDAQ: ROKU) announced it will begin rolling out Premium Subscriptions on The Roku Channel later today. All supported devices are expected to receive the update in the coming weeks, beginning with Roku® players and concluding with Roku TV™ models. Premium Subscriptions enables users to browse, trial and subscribe to popular premium entertainment services within The Roku Channel. Users who sign-up for EPIX, SHOWTIME® and STARZ before March 31, 2019, can enjoy a 30-day free trial of those services on The Roku Channel. Additionally, viewing of The Roku Channel directly from within the Roku mobile app is available for iOS devices starting today. The update for Android devices is expected to begin to roll out in mid-February. This press release contains “forward-looking” statements that are based on our beliefs and assumptions and on information currently available to us on the date of this press release. Forward-looking statements may involve known and unknown risks, uncertainties and other factors that may cause our actual results, performance or achievements to be materially different from those expressed or implied by the forward-looking statements. 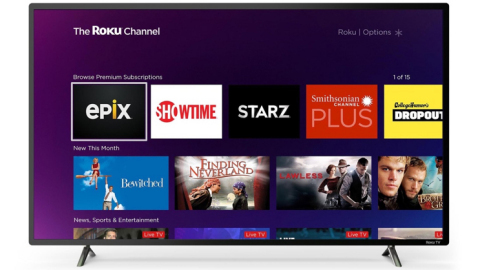 These statements include but are not limited to the features, benefits, impact and availability of Premium Subscriptions on The Roku Chanel; the free trial of certain premium services; availability of additional premium partners on the RokuChanel; and the timing and benefits of updates to the Roku mobile app. Except as required by law, we assume no obligation to update these forward-looking statements publicly, or to update the reasons actual results could differ materially from those anticipated in the forward-looking statements, even if new information becomes available in the future. Important factors that could cause our actual results to differ materially are detailed from time to time in the reports Roku, Inc. files with the Securities and Exchange Commission, including our Form 10-K for the year ended December 31, 2017 and our most recent Quarterly Reports on Form 10-Q. Copies of reports filed with the SEC are posted on Roku’s website and are available from Roku without charge.